When you want to say thanks in a BIG way this is the gift tower to send! 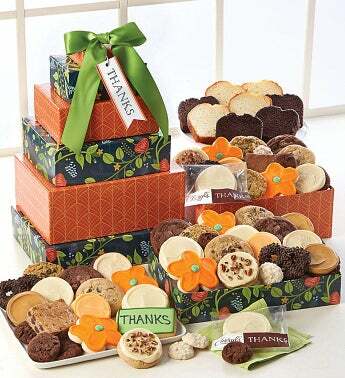 Your friends and coworkers will love this grand assortment of buttercream frosted cookies, a delicious assortment of gourmet cookies, our signature fudge, blondie walnut and toffee brownies along with crunchy snack size double chocolate cookies, chocolate pretzel clusters, a crunchy hand decorated thank you sugar cookie, cake slices and gourmet drizzled pretzels. 60 pieces. Kosher.